The sun’s always shining somewhere in the world, and who needs an excuse to go on vacation right!? 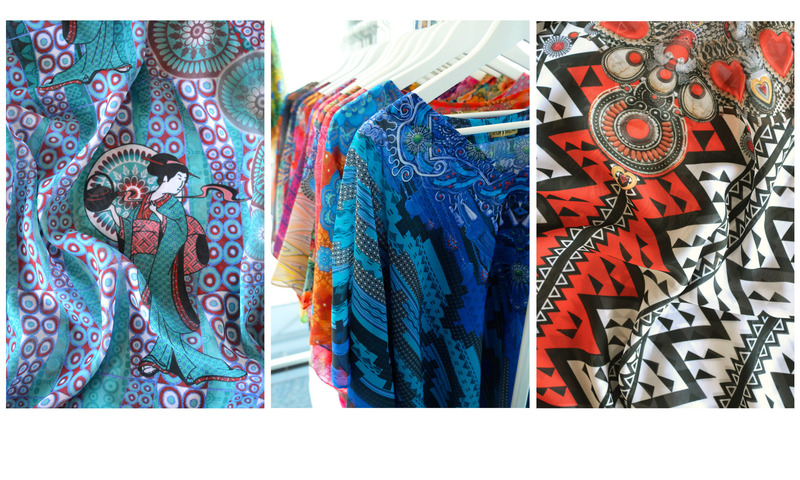 These incredible kaftans and cover ups are sure to pack a punch when it comes to turning heads, and are the perfect grab and go garment to throw in your bag, alongside your sunhat & shades. The print detail and colours shout luxury, with a fabulous range of gorgeous florals, geometrics, tribal, and tropical designs. … the only challenge is … which ones to choose!? ‘HASANI’ (US)$150 + postage. Free size, length approx 80cms. To purchase or check availability of this item, contact here quoting ref.KA15 for details. ‘ZALIKI’ (US)$150 + postage. Free size, length approx 80cms. To purchase or check availability of this item, contact here quoting ref.KA36 for details. ‘UMA’ (US)$150 + postage. Free size, length approx 80cms. To purchase or check availability of this item, contact here quoting ref.KA33 for details. ‘KAIRA’ (US)$180 + postage. Free size, length approx 100cms. To purchase or check availability of this item, contact here quoting ref.KA02 for details. ‘DARIA’ (US)$150 + postage. Free size, length approx 80cms. To purchase or check availability of this item, contact here quoting ref.KA10 for details. ‘SIRENA’ (US)$150 + postage. Free size, length approx 80cms. To purchase or check availability of this item, contact here quoting ref.KA35 for details. ‘ELEKTRA’ (US)$150 + postage. Free size, length approx 80cms. To purchase or check availability of this item, contact here quoting ref.KA32 for details. ‘ADRIANO’ (US)$180 + postage. Free size, length approx 100cms. To purchase or check availability of this item, contact here quoting ref.KA01 for details. ‘COCO’ (US)$150 + postage. Free size, length approx 80cms. To purchase or check availability of this item, contact here quoting ref.KA26 for details. ‘AVIANA’ (US)$150 + postage. Free size, length approx 80cms. To purchase or check availability of this item, contact here quoting ref.KA16 for details. ‘SOPHIA’ (US)$150 + postage . Free size, length approx 80cms. To purchase or check availability of this item, contact here quoting ref.KA23 for details. ‘MAYA’ (US)$150 + postage. Free size, length approx 80cms. To purchase or check availability of this item, contact here quoting ref.KA22 for details. ‘ARIANNA’ (US)$150 + postage. Free size, length approx 80cms. To purchase or check availability of this item, contact here quoting ref.KA21 for details. ‘YASMIN’ (US)$150 + postage. Free size, length approx 80cms. To purchase or check availability of this item, contact here quoting ref.KA25 for details. ‘TALIA’ (US)$150 + postage. Free size, length approx 75cms. To purchase or check availability of this item, contact here quoting ref.KA30 for details. ‘IMOGEN’ (US)$150 + postage. Free size, length approx 80cms. To purchase or check availability of this item, contact here quoting ref.KA17 for details. ‘ISABEL’ (US)$150 + postage. Free size, length approx 100cms. To purchase or check availability of this item, contact here quoting ref.KA14 for details. ‘ANGELICA’ (US)$150 + postage. Free size, length approx 80cms. To purchase or check availability of this item, contact here quoting ref.KA24 for details. ‘SAMARA’ (US)$150 + postage. Free size, length approx 80cms. To purchase or check availability of this item, contact here quoting ref.KA41 for details. ‘NEEMA’ (US)$180 + postage. Free size, length approx 100cms. To purchase or check availability of this item, contact here quoting ref.KA04 for details. ‘OPHELIA’ (US)$150 + postage. Free size, length approx 80cms. To purchase or check availability of this item, contact here quoting ref.KA27 for details. ‘AMARA’ (US)$150 + postage. Free size, length approx 80cms. To purchase or check availability of this item, contact here quoting ref.KA12 for details. ‘OMARI’ (US)$180 + postage. Free size, length approx 100cms. To purchase or check availability of this item, contact here quoting ref.KA03 for details. ‘AMELIE’ (US)$150 + postage. Free size, length approx 80cms. To purchase or check availability of this item, contact here quoting ref.KA29 for details. ‘IMANI’ (US)$180 + postage. Free size, length approx 100cms. To purchase or check availability of this item, contact here quoting ref.KA05 for details. ‘AISHA’ (US)$150 + postage. Free size, length approx 80cms. To purchase or check availability of this item, contact here quoting ref.KA09 for details. ‘OREANA’ (US)$150 + postage. Free size, length approx 80cms. To purchase or check availability of this item, contact here quoting ref.KA31 for details. ‘MIKA’ (US)$150 + postage. Free size, length approx 80cms. To purchase or check availability of this item, contact here quoting ref.KA28 for details. ‘SOOKI’ (US)$150 + postage. Free size, length approx 80cms. To purchase or check availability of this item, contact here quoting ref.KA13 for details. ‘TABITHA’ (US)$180 + postage. Free size, length approx 100cms. To purchase or check availability of this item, contact here quoting ref.KA06 for details. ‘MAHALA’ (US)$150 + postage. Free size, length approx 80cms. To purchase or check availability of this item, contact here quoting ref.KA20 for details. ‘RANIA’ (US)$180 + postage. Free size, length approx 100cms. To purchase or check availability of this item, contact here quoting ref.KA37 for details. ‘SURI’ (US)$150 + postage. Free size, length approx 80cms. To purchase or check availability of this item, contact here quoting ref.KA40 for details. ‘SELENE’ (US)$150 + postage. Free size, length approx 80cms. To purchase or check availability of this item, contact here quoting ref.KA39 for details. ‘TAMIKA’ (US)$150 + postage. Free size, length approx 80cms. To purchase or check availability of this item, contact here quoting ref.KA38 for details. ‘LEILANI’ (US)$150 + postage. Free size, length approx 80cms. To purchase or check availability of this item, contact here quoting ref.KA18 for details. ‘MARIKO’ (US)$150 + postage. Free size, length approx 80cms. To purchase or check availability of this item, contact here quoting ref.KA11 for details. ‘FREDA’ (US)$150 + postage. Free size, length approx 80cms. To purchase or check availability of this item, contact here quoting ref.KA34 for details. ‘ABELLA’ (US)$150 + postage. Free size, length approx 80cms. To purchase or check availability of this item, contact here quoting ref.KA08 for details. ‘ISADORA’ (US)$150 + postage. Free size, length approx 80cms. To purchase or check availability of this item, contact here quoting ref.KA19 for details.